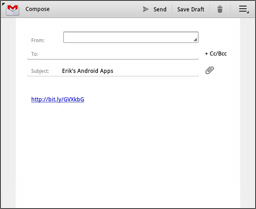 Emaily makes it really easy to email a short link to the current web page directly from your Android Browser. 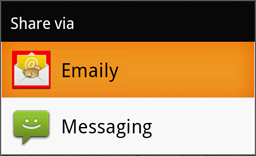 Emaily also works with applications that can share a link, such as Google Reader, etc. The placement/look of the menu button may vary depending on your device. 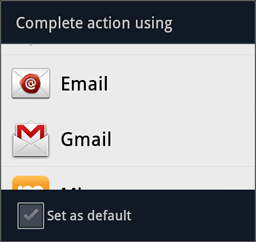 Note: This step is unnecessary when using Android 3.0 or higher. Tip: You can also tap and hold in the browser's address bar to access the share menu directly. Tip: Tick the 'Set as default' box to never have to repeat this step again. 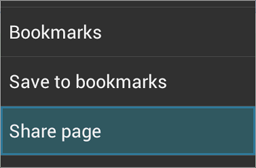 Tip: You can tap and hold on any link on a web page to bring up the same share menu.